ELISA: Antibody specificity was verified by ELISA against peptide conjugated to BSA (HHHHHH-BSA). 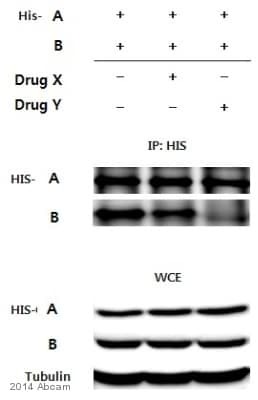 A 1:25,000 dilution of the antibody gave an OD=1.0 in a 15 minute reaction using HRP-conjugated Goat anti-Rabbit IgG at 1:20,000 and TMB as the substrate. Appropriate specificity controls were run. ICC/IF: His tag expressed in HEK293 cells. WB: HeLa whole cell lysate transfected with His-tag. ChIP: HEK-293T cell line. 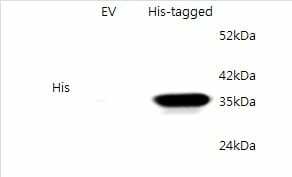 This antibody recognizes both C-terminal and N-terminal tags. HIS-TAG® is a trademark of EMD Biosciences, Inc.
Our Abpromise guarantee covers the use of ab9108 in the following tested applications. ChIP Use at an assay dependent concentration. ChIP was performed with 25 ug chromatin, 5ug of antibody and 20 ul of Protein A/G beads. (see Abreview published on 22nd January, 2007). ab9108 staining CACNB3 with His tag expressed in HEK293 cells by ICC/IF (Immunocytochemistry/immunofluorescence). Cells were fixed with paraformaldehyde, permeabilized with 0.5% Triton X-100 and blocked with 5% serum for 20 minutes at 25°C. Samples were incubated with primary antibody (1/500 in 1% goat serum, 0.1% TX100 and PBS) for 16 hours at 4°C. 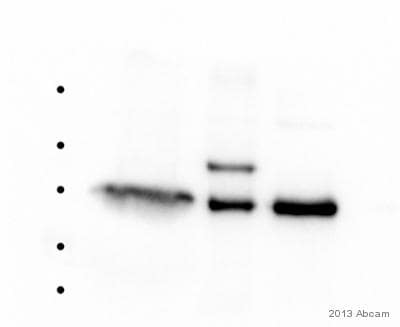 An Alexa Fluor® 488-conjugated Goat anti-rabbit IgG polyclonal was used as the secondary antibody (1/750). A stably transfected 293T human cell line harbouring the GAL4 upstream activation sequence was transiently transfected with a Myc or His - tagged GAL4 DNA Binding Domain construct. 48 hours post transfection Chromatin was prepared according to the Abcam X-ChIP protocol. The ChIP was performed with 25 ug chromatin, 5ug of antibody and 20 ul of Protein A/G beads. 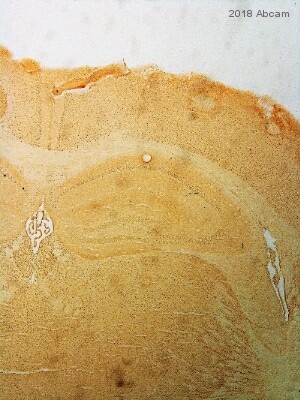 A non-specific antibody was used as the negative control. 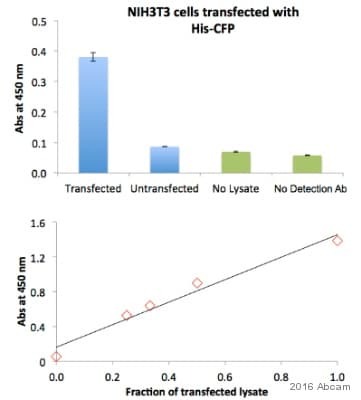 The immunoprecipitated DNA was quantified by real time PCR (SYBR Green approach). Use of ab9108 in western blotting at 1:1000 against Epitope Tag Positive Control lysate (ab4524). 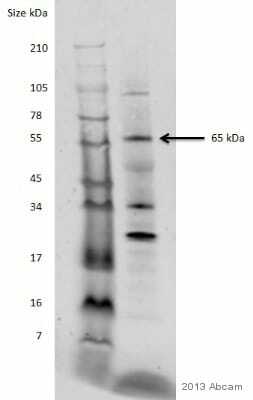 verified by ELISA against peptide conjugated to BSA (HHHHHH-BSA)". My question to you is: do you sell this his-tagged BSA as well? Unfortunately we do not have a His tagged BSA in our catalog and can not offer HIS-tagged BSA for sale as it's just a component within our QC procedures.